An increasing number of articles warn us that climate is changing but is that a bad thing? Many scientists say yes and that it could have serious consequences. For instance, let’s take the United Kingdom. It is estimated that by the 2080s the United Kingdom will experience damage from flooding which will cost them between £2bn and £12bn annually, which compared with current costs is an increase of approximately 2 to 10 times (Duncan, 2013). In addition, it is not only tax payer’s pockets that will suffer but also animals and plants as they are very sensitive to climate change. Hence, the assumption that climate change is bad for living creatures and that it is desirable to stop it would be correct. But what causes it? What is the part of the globalisation of free trade in climate changing? First of all, let us look why there is a belief that economic growth is good for the environment. 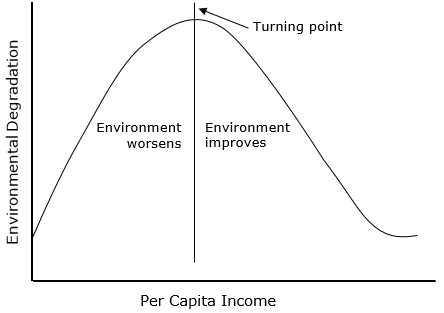 The Environmental Kuznets Curve demonstrates that in the short-term during the early stages of industrial development, economic growth can worsen the environment. However, after a certain point of economic growth environmental conditions improve because citizens begin to pressure the government for a healthier living environment and partly because governments then have the financial capability to provide one (Ravenhill, 2011). For example, Japan perfectly fits the Environmental Kuznets Curve. After the Second World War, Japan’s industrial production and economic growth increased together with pollution, until the 1960s when citizens began protesting. In response, the government introduced strict environmental regulations and business developed new environmental technologies. Thus, environmental conditions began to improve (Imura and Schreurs, 2005). Therefore, since there is a belief that globalisation of free trade fosters economic growth, many supporters argue that globalisation of free trade is also good for the environment (Ravenhill, 2011). Globalisation opens borders for new markets and countries attract new investors by this promoting economic growth which according to the Environmental Kuznets Curve leads to the better environment. Furthermore, as Lomborg (2009) argues, globalisation also transfers environmental technologies and higher standards from North to South. Producers are forced to follow standards of North (which are relatively high) in order to get access to the global market. So by viewing this combined with the environmental Kuznets Curve we can come to the conclusion that globalisation is really good for the environment. However, there are many critics who see the Environmental Kuznets Curve as a naive and misleading. For instance, let’s look again at the case of Japan’s environmental change to illustrate the deceptive nature of the Environmental Kuznets Curve. Hall (2002) argues that the reason Japan managed to improve its domestic environment was partly because dirty industries were transferred into South-East and North-East Asia. Therefore, the overall pollution didn’t disappear, it was just relocated. This is just one of many similar examples. Another critic’s statement is that globalisation of free trade leads to greater environmental disaster. It is partly because of global corporations, critics see the globalisation of free trade as a poisonous thing for poor countries and the environment (Ravenhill, 2011). The basic aim of most corporations is to maximise profits at any costs which can result in environmental problems. There are many poor countries in which governments strongly want to promote economic growth. Therefore, in order to attract investments governments have little choice but to use low environmental standards. As a result, global corporations start flowing into the country because they are willing to relocate in order to avoid tough environmental regulations in other countries and thus maximise profits. In this way, corporations cause serious damage to the environment. All in all, there is certainly some truth in the Kuznets Curve, however, critics show that countries should not look only for internal solutions, but have to think at a global level, because we all live on the same planet and simply relocating the problem rarely makes for any environmental gains. Also, critics noted that blindly pursuing economic growth can cause serious damage to the environment due to the willingness of corporations to relocate whenever they face tough environmental regulations. The main conclusion to draw is that global issues need global unification of countries to find global solutions.